Miniature human liver grown in mice. Transplanting tiny 'liver buds' constructed from human stem cells restores liver function in mice, researchers have found. Although preliminary, the results offer a potential path towards developing treatments for the thousands of patients awaiting liver transplants every year. The liver buds, approximately 4 mm across, staved off death in mice with liver failure, the researchers report this week in Nature. The transplanted structures also took on a range of liver functions — secreting liver-specific proteins and producing human-specific metabolites. But perhaps most notably, these buds quickly hooked up with nearby blood vessels and continued to grow after transplantation. The results are preliminary but promising, says Valerie Gouon-Evans, who studies liver development and regeneration at Mount Sinai Hospital in New York. “This is a very novel thing,” she says. Because the liver buds are supported by the host’s blood system, transplanted cells can continue to proliferate and perform liver functions. However, she says, the transplanted animals need to be observed for several more months to see whether the cells begin to degenerate or form tumours. There is a dire scarcity of human livers for transplant. 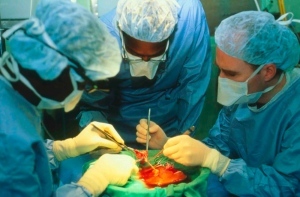 In 2011, 5,805 adult liver transplants were done in the United States. That same year, 2,938 people died waiting for new livers or became too sick to remain on waiting lists. However, attempts to create complex organs in the laboratory have been challenging. Takanori Takebe, a stem-cell biologist at Yokohama City University in Japan who co-led the study, believes this is the first time that people have made a solid organ using induced pluripotent stem cells, which are created by reprogramming mature skin cells to an embryo-like state. Testing whether liver buds could help sick patients is years away, says Takebe. Apart from the need for longer-term experiments in animals, it is not yet possible to make liver buds in quantities sufficient for human transplantation. In the current work, Takebe transplanted buds surgically at sites in the cranium or the abdomen. In future work, Takebe hopes to create liver buds small enough to be delivered intravenously in mice and, eventually, in humans. He also hopes to transplant the buds to the liver itself, where he hopes they will form bile ducts, which are important for proper digestion and were not observed in the latest study. The researchers make the liver buds from three types of human cells. First, they coax induced pluripotent stem cells into a cell type that expresses liver genes. Then they add endothelial cells (which line blood vessels) from umbilical cord blood, and mesenchymal stem cells, which can make bone, cartilage and fat. These cell types also come together as the liver begins to form in the developing embryo. The project began with an unexpected phenomenon, says Takebe. Hoping to find ways of to make vascularized liver tissues, he tried culturing multiple cell types together and noticed that they began to self-organize into three-dimensional structures. From there, the process for making liver buds took hundreds of trials to tweak parameters such as the maturity and ratios of cells. This strategy takes a middle path between two common strategies in regenerative medicine. For simple, hollow organs such as the bladder and trachea, researchers seed scaffolds with living cells and then transplant the entire organ into patients. Researchers have also worked to create pure cultures of functional cells in the laboratory, hoping that cells could be infused into patients, where they would establish themselves. But even if the cells work perfectly in the laboratory, says Gouon-Evans, the process of harvesting cells can damage them and destroy their function. Self-organizing structures from stem cells have also been observed for other organ systems, such as the optic cup, an early structure in eye development2. And 'mini-guts' have been grown in culture from single human stem cells3. Takebe believes that the self-organizing approach might also be applicable to other organs, such as lung, pancreas and kidney.